Cambodian garment workers have been striking and protesting since May, advocating for an increase in their current $128 USD monthly minimum wage. The International Labor Organization, Human Rights Watch, and international human rights groups have raised concerns over workers being underpaid, overworked, sexually harassed, and discriminated against if pregnant. Moreover, thousands of garment workers have fainted on the job since 2011 due to malnourishment, overwork, and poor air circulation in the workplace. According to a Human Rights Watch report, workers have been ordered to fulfill daily quotas of 1500 clothing pieces, often working until 9 p.m. and receiving only 15 minutes to eat lunch. Since 2013, workers have clashed with government forces while striking over wage disputes, forced overtime work, and prejudice against pregnant women. In 2014, five workers were fatally shot by Cambodian authorities during industry-wide protests. The firm DC Research recently conducted a survey examining garment workers’ expenses. Funded by the German Friedrich-Ebert-Stiftung Foundation, and international labor rights organizations IndustriALL Global Union and Solidarity Center, the survey was the first of its kind in six years. Union members interviewed 745 garment workers across Cambodia. Findings revealed that monthly expenditures, including remittances back to families in rural communities, averaged $207.50 USD per person. To keep up with expenses, many workers try to support themselves with second jobs and working overtime. Cambodia’s 28-member Labor Advisory Committee is scheduled to meet this week to negotiate a newly proposed minimum wage for the country’s 700,000 garment workers. However, the committee’s seven union leaders cannot agree on a recommended wage. Given the recent survey findings, some leaders want to propose a $207 minimum wage, while others are more cautiously proposing an increase of only 10-15 percent. The Labor Ministry’s Spokesman Heng Sour claims that the unions will lose their right to negotiate if the seven members cannot agree on a single proposed rate. 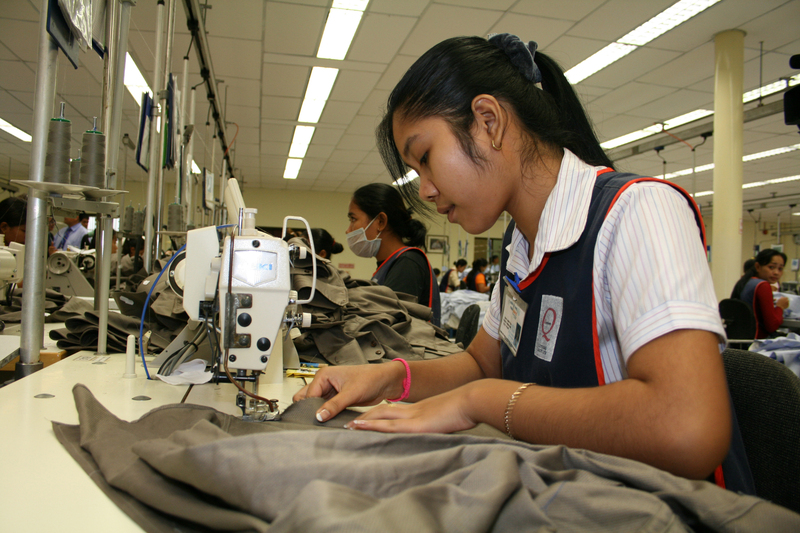 Van Sou Ieng, chairman of the Garment Manufacturers Association in Cambodia (GMAC), states that the only acceptable increase in wage would reflect the inflation rate, which is less than three percent. He insists that they cannot afford any further increase, given competition from other countries, notably Thailand and Vietnam. Cambodia’s garment industry makes up approximately one-third of its national GDP. He also claims that workers take home more than revealed in the survey and dismisses the survey and foreign involvement as malicious and “disruptive.” Labor rights advocates, including William Conklin, Country Director for Solidarity Center, anticipate that an $80 wage increase will not be accepted, especially when union leaders do not have a unified voice nationally. Moreover, it is expected that clothing brands themselves could best influence the wage debate. Representatives from brands such as H&M, Arcadia, and C&A were in the country last week discussing the wage increases, though no information has been released from their meetings. Advocates are concerned that even if the wage increases, landlords and stores in proximity to the garment factories will respond by raising prices. The minimum wage issue reflects a deeper struggle in the working class, stemming back to the Khmer Rouge regime. During the regime, schools were closed and intellectuals eradicated, in attempts to achieve a classless, agrarian society. Today, half of Cambodia’s population is under the age of 25 and the vast portion of the working class remains undereducated and holds no professional working skills. Many workers, primarily women, migrate from rural towns into Phnom Penh to work in garment factories. These workers endure long, arduous working conditions, often with the priority to send money back to their families. Negotiations between government, employers, and unions are slated to continue through the week. Carmichael, Robert. 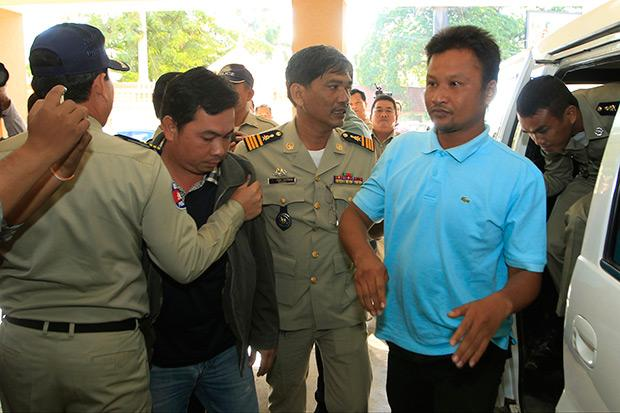 “HRW: Cambodia Failing to Protect Garment Workers.” Voice of America. 12 Mar. 2014. Carmichael, Robert. “Pilot Project to Boost Nutrition for Cambodian Garment Workers.” Voice of America. 14 Oct. 2014. Cox, Jonathan. “Garment Workers Want More Pay to Cover Costs.” Khmer Times. 21 Sept. 2015. Dara, Mech and Zsombor Peter, “Government Tells Unions to Pick a Minimum Wage or Lose Their Say.” The Cambodia Daily. 23 Sept. 2015. Mony, Serey and Samean Yun. 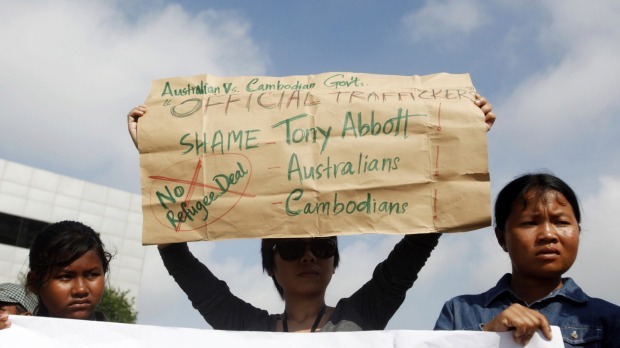 “Garment Workers Demand Cambodian Government Resolve Employment Issue.” Radio Free Asia. 21 Sept. 21, 2015. Reaksmey, Hul. 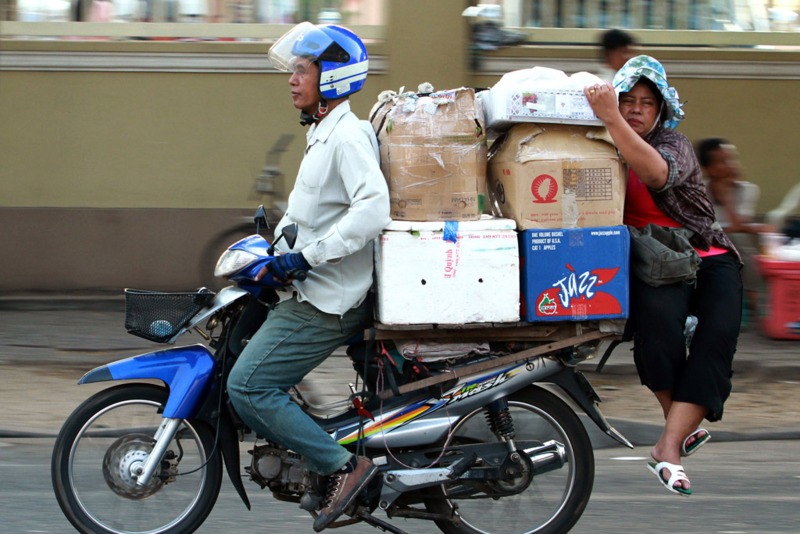 “Manufacturers Say They Can’t Raise Wage to $207 Per Month.” Voice of America, Cambodia: Khmer. 22 Sept. 2015. “Work Faster or Get Out: Labor Rights Abuses in Cambodia’s Garment Industry.” Human Rights Watch. 11 March 2015. This entry was posted in Cambodia, Current Events and tagged Cambodia, internship, labor rights, news in review on October 1, 2015 by Kara E Wong Wong. “We’re here to connect with each other’s efforts, so let’s get started!” This was the invitation from one of the IPJ Women PeaceMakers (WPMs) as we introduced ourselves during our very first roundtable dinner with a group of women activist leaders in Cambodia’s capital city, Phnom Penh. The next morning as the sun spilled out across the sky, our team of Asian Women PeaceMakers gathered with 30 women farmers representing three districts around Phnom Penh. Along with fresh coconut juice, the women shared openly and passionately the challenges they are facing: lack of education, ongoing situations of abuse and resistance to their attempts to strengthen their voices and those of other women in the political sphere. The number of women who are active in local or national government positions is very small, and the particular trials women face are for the most part overlooked. Again the question echoed: How can we better connect with one another and encourage women’s active participation in peacebuilding in our communities? WPM Mary Ann Arnado of the Philippines, speaking with compassion and humility, told of her experience bringing together more than 10,000 internally displaced persons to demand a ceasefire in Mindanao. As she spoke of their success, images of the thousands of people lining the roadway with their signs demanding the ceasefire appeared in the background. Then Cambodian WPM Thavory Huot shared her personal, painful efforts in the enormous task of disarmament in Cambodia following the Khmer Rouge. She too had witnessed success because of her struggles, and she urged the women gathered not to give up. This exchange of stories and strategies filled the room with hope, and began to plant the seeds of connection between the women from different districts who were present. This continued throughout the seven-day summit. The WPMs shared their stories and exchanged ideas and strategies with civil society leaders, women’s groups, political leaders, local NGO staff and a group of young Buddhist women who are students and tailors, as well as a Muslim women’s cooperative in Battambang Province in northwestern Cambodia. Throughout our meetings with local organizations and groups, the topic of the challenges and action needed to ensure implementation of U.N. Security Council Resolution 1325 in Asia surfaced. In both formal and informal conversations, the WPMs discovered a common necessity and desire to monitor and work together to operationalize Resolution 1325 throughout Asia. Understanding that Resolution 1325 requires parties in conflict to respect women’s rights, the women wanted to learn how to call on it to support women’s participation in peace negotiations and post-conflict reconstruction. The women felt they could play a significant role in the prevention and resolution of conflicts, and saw their participation as vital in the process of maintaining peace and security. However, despite the resolution’s passing more than 10 years ago, Cambodia and many other countries in Asia and around the world have yet to develop national action plans as a first step in its implementation. The United States only recently – in December 2011 – began exploring how it will launch its own. Sitting together on the last day of the summit, the Women PeaceMakers explored options and made plans for their Asia Regional Network’s development and growth in 2012. Ideas for approaches, activities and strategies around their common 1325 goal emerged, and a newfound sense of motivation planted itself in the group. With strengthened relations and partnerships, new insights and tools to use in their own work, and an agenda for collective action for the new year, the final strategy session came to a close. “I feel rejuvenated and confident that I can continue to do this work, and that I am not, ever, alone,” reflected one PeaceMaker, capturing the essence of the summit. All of us left Cambodia looking forward to the next Asia Regional Network summit to be held in 2012 – and ready for the work ahead. Click here for the first post about the summit, describing the current situation in Cambodia. This entry was posted in Cambodia, In the Field, Women PeaceMakers on January 4, 2012 by nomae. Upon arrival in Phnom Penh, Zahra and I quickly dropped our bags at a small hotel and headed out to the “Women’s Hearings: True Voices of Women during the Khmer Rouge Regime on Sexual Violence.” Theresa de Langis, a former Peace Writer (2007) who subsequently worked for UNIFEM/UN Women in Afghanistan, was facilitating these shadow hearings in Cambodia. Theresa also visited the IPJ in October, as the rapporteur for one of the U.S. civil society consultations on the formulation of a U.S. National Action Plan to implement U.N. Security Resolution 1325. Here in Cambodia’s capital, the testimonies of survivors and witnesses of sexual violence under the Khmer Rouge Regime, along with statements from legal experts, were profoundly moving. These crimes have been rejected by the formal tribunals that are currently underway, and the Women’s Hearings are an informal effort at validation and redress for the atrocities women suffered. The call for an official tribunal was a key topic in the IPJ’s Global Women’s Court of Accountability back in 2005, but no one intended or expected that testimonies about the crimes against women would not be included in the tribunal for the mass murderers. There were many young Cambodians in the hearing’s audience who were just discovering the true and vast horrors from the time of the Killing Fields. Fear, trauma and simply regaining a life had been the priorities for more than 20 years, so many parents had repressed, moved on from or even denied the terrors they saw and suffered. The loss of so many intellectuals, teachers and leaders, and the brainwashing and forced labor camps had a stifling impact on both truth and its recovery. After the hearings, Wenny Kusuma, who heads the UN Women Cambodia office and has worked on women, peace and security issues for a number of years, joined us for updates and discussion. This intense first day of feeling, seeing and discussing the profound abuse of women’s rights set a very real stage for engagement with the IPJ Women PeaceMakers (WPM) of Asia arriving in the home of Cambodian WPM Thavory Huot. By December 9, Zarina Salamat of Pakistan, Manjula Pradeep of India, and Mary Ann Arnado and Bae Liza Saway of the Philippines joined us as Thavory gave a first orientation to Cambodia with a visit to the Killing Fields and Tuol Sleng Prison (S-21), now the Cambodian Genocide Museum. It is estimated that one-third of the population were killed or died of starvation and disease during the 1975-1979 reign of the Khmer Rouge. Dith Pran’s story in the film “The Killing Fields” is devastatingly palpable here, as you walk quietly from mass grave to mass grave and to the tree where babies’ little bodies were smashed, all the while imagining the “patriotic music” that covered the sounds of dying. After this awakening to one of the most horrific crimes of the last century, the beautiful glass spiral of the pagoda-like structure where the skulls and bones are now honored, layer upon layer, cannot leave your thoughts or prayers. Click here for the second post about the summit, detailing the rest of the Women PeaceMakers Cambodian summit. This entry was posted in Cambodia, In the Field, Women PeaceMakers on December 22, 2011 by nomae.